Support structures are generated in part geometries having shallow angles and overhanging features. Support structures, as the name implies, are ancillary geometries necessary to support the main part geometry in order to achieve the desired output of the latter. There are a few technologies in 3D printing viz. Selective Laser Sintering (SLS), and Color Jet Printing (CJP) where there is no support structure generation. Whereas, there are other technologies viz. Fused Filament Fabrication (FFF) (FFF) and Stereolithography (SLA) (SLA), where support structures are generated. Unlike Subtractive manufacturing wherein you start with a chunk of raw material and machine it until you achieve the desired part geometry, in 3D printing, you start with no material at all. 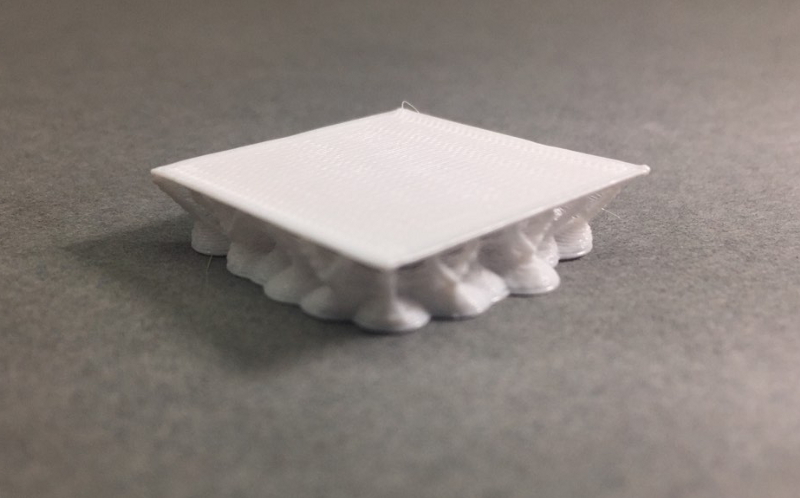 The printer keeps adding the material layer by layer, hence 3D Printing is also called as Additive Manufacturing. Consider the part geometry shown in Fig. a. After orienting the part as shown, the software will slice the part into layers. The nozzle will deposit first layer of material onto the platform. Then the platform will go down by an amount equal to one layer thickness setting, and the nozzle will deposit the next layer. 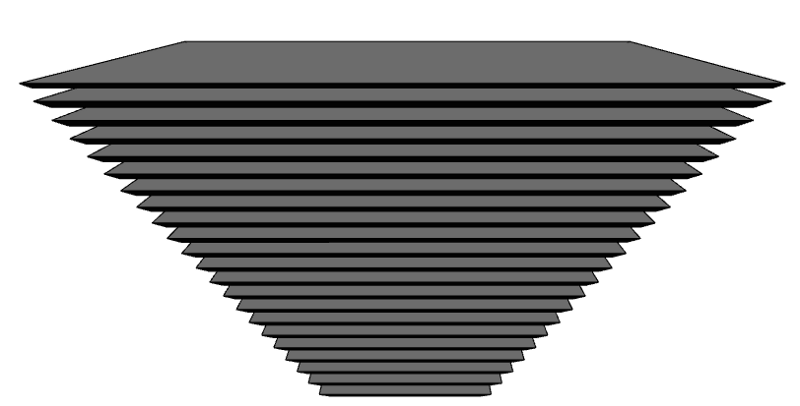 While depositing the next layer, the layer will droop and sag, as shown in Fig.b, since it doesn’t have a resting base or a flat plane to deposit the next layer upon. 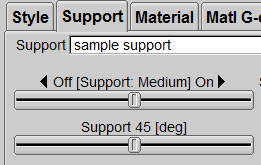 In this case, the software will have already calculated the need of supports in this area during the slicing operation. 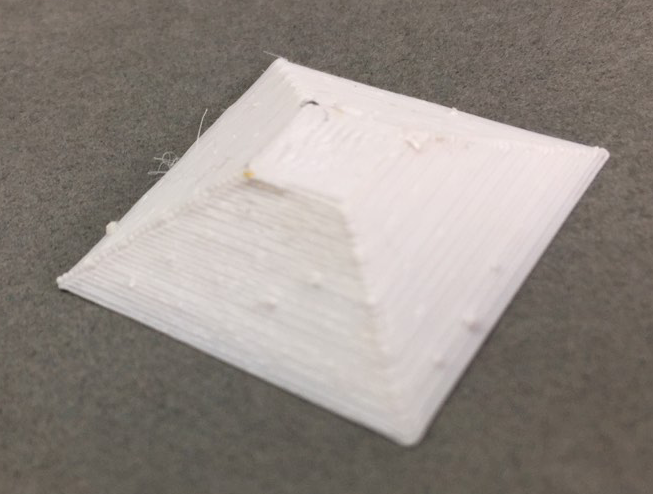 So before depositing the next layer, the printer will have started depositing the support structures, from the first layer itself. The printer will keep fabricating the supports along with the main part geometry. This process will continue till the entire part geometry is fabricated, as shown in Fig. c.
Part geometries having features or surfaces at an angle less than 45˚ with the horizontal will have support structure generation, whereas, any geometry with features at an angle greater than 45˚ with the horizontal will be self-supporting. Support structures are generated in part geometries having shallow angles and overhanging features. There is a parameter (Refer Fig. d) which, based on the input value, controls support structure generation. The average setting is 45˚. This implies that, part geometries having features or surfaces at an angle less than 45˚ with the horizontal will have support structure generation, whereas, any geometry with features at an angle greater than 45˚ with the horizontal will be self-supporting. This parameter can be tweaked as per requirement. But we recommend a default value of 45˚. If the same part had been oriented as shown in Fig. e, the subsequent layers would have had the previous layer as a resting base. Basically, the same part, if oriented as shown in Fig. e, would have yielded the same final part geometry but without supports, as shown in Fig. f.
The aim in 3D Printing is to fabricate the parts with little or no support structures at all. 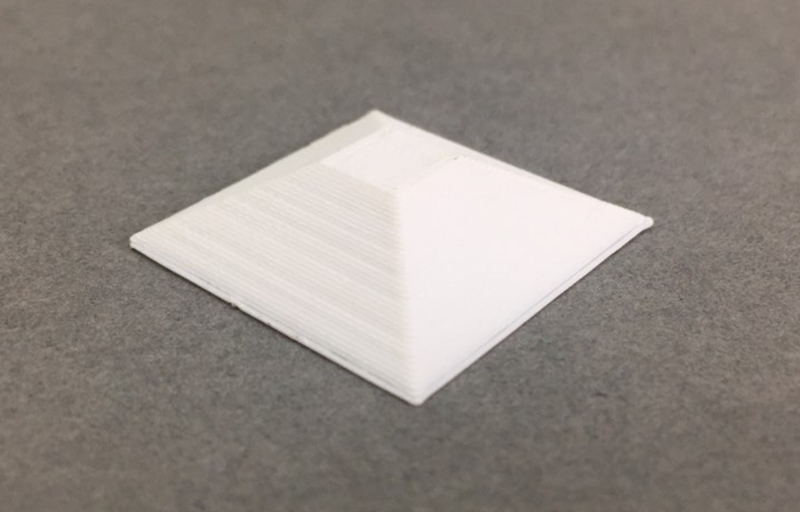 Thus, it’s essential that the part orientation is optimal to achieve a good quality print. Support structure generation results in higher costs because more material is now consumed to fabricate the same part. Also, support structure removal leaves burr marks on the surface. This incurs additional post-processing cost. 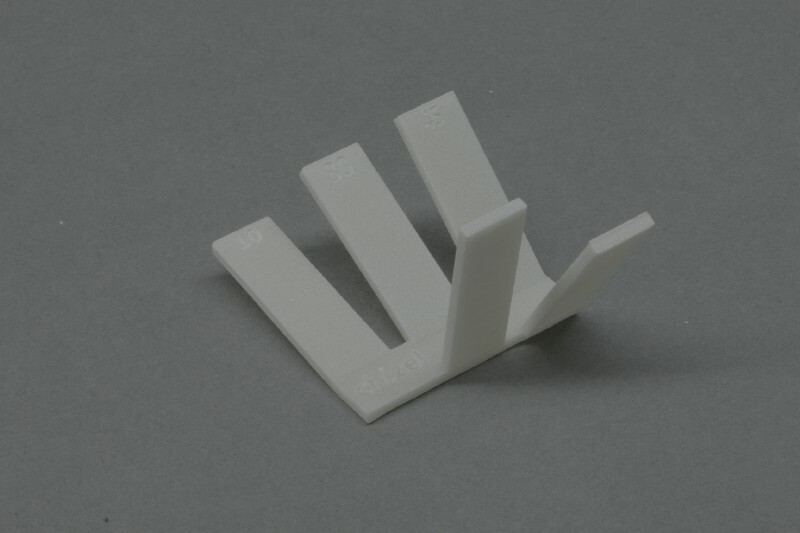 The aim in 3D Printing is to fabricate the parts with little or no support structures at all. Support structures are of two types. They are either soluble or non-soluble. Part geometries with soluble support structures are immersed in a liquid bath which dissolves these supports leaving behind the final part geometry. The non-soluble support structures have to be removed manually. SLS is one of those unique technologies in 3D Printing that offer a total design freedom. The methodology and concept behind support structures in Fused Filament Fabrication (FFF) and SLA is similar. Let us now understand why there is no support structure generation in SLS technology. Selective Laser Sintering (SLS) is a powder-based laser sintering technology. The laser scans and sinters a bed of powder material based on the input 3D CAD file. During this process, the overhanging or protruding features, if any, are supported by the unsintered powder. Thus, in SLS technology, the unsintered powder itself acts as support. While taking the part out of the bed, the unsintered powder can be cleaned away leaving behind the desired part geometry. Hence, SLS technology results in a support-free part. SLS is one of those unique technologies in 3D Printing that offer a total design freedom. The part considered in this article being a fairly simple geometry, the orientation was pretty straight forward. But in complex part geometries, deep understanding of the material and technology is necessary to orient the part in the most optimal way in order to obtain the desired output in the most cost-effective manner. Previous PostWill Additive Manufacturing replace Subtractive Manufacturing?